Instant Pot Creamy Tuscan Garlic Chicken is a quick 30 minute restaurant quality meal that you can make any night of the week. Keto and Low Carb. Several of you have written to me requesting that I convert your favorite recipe. Today, I am bringing to you this Instant Pot Creamy Tuscan Garlic Chicken. 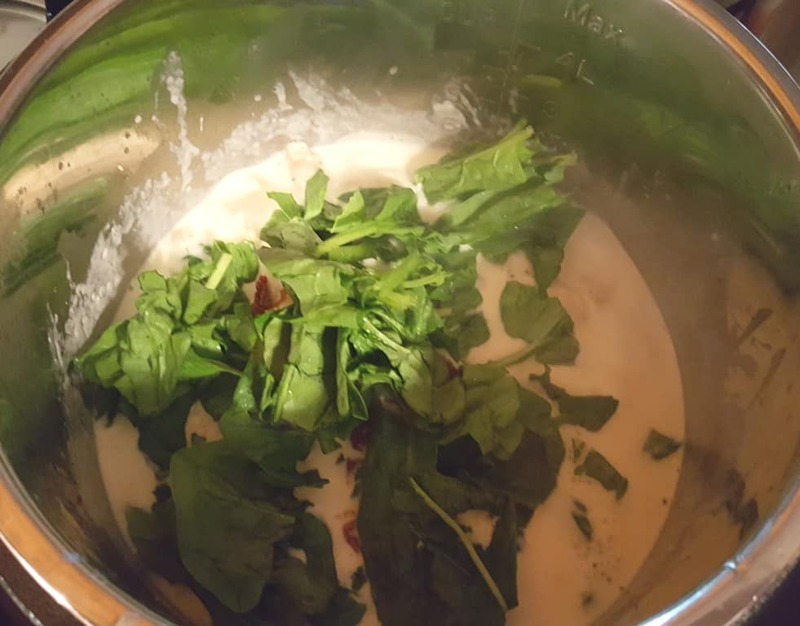 Kathy Betit Gallagher, from my This Old Gal Facebook Cooking Group, asked me to convert a recipe for her to be made in her Instant Pot, Mealthy MultiPot or Pressure Cooker. 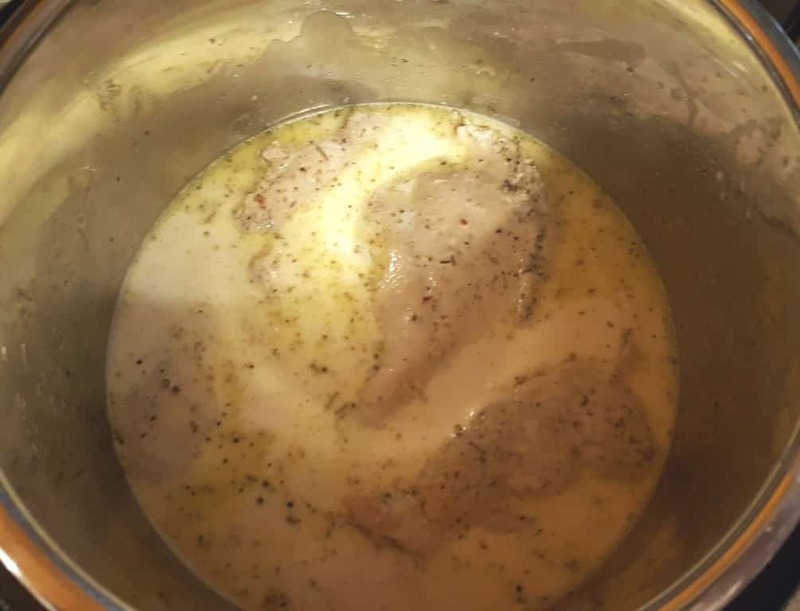 What is Instant Pot Creamy Tuscan Garlic Chicken? Chicken cooked in a creamy garlic sauce. Spinach and Sun Dried Tomatoes are added in at the end. I made a few changes to adapt Kathy’s stovetop recipe to the Instant Pot, Mealthy MultiPot or Pressure Cooker, which include adding more spices. 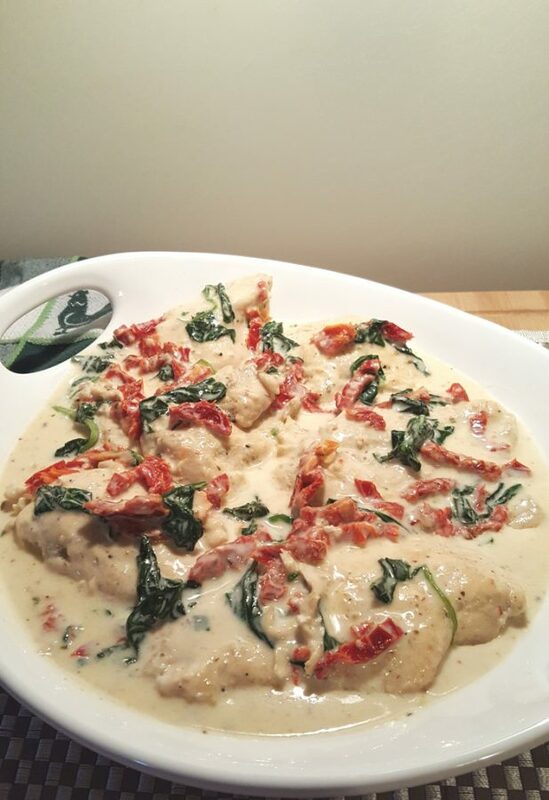 What are the Ingredients for Instant Pot Creamy Tuscan Garlic Chicken? 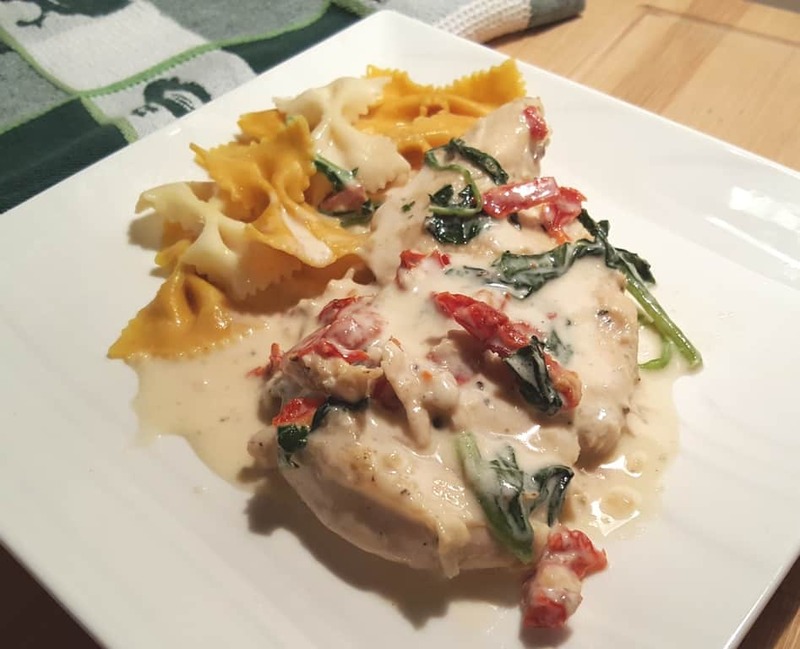 Kathy and my testers from my This Old Gal Cooking Group tell me that this Instant Pot Creamy Tuscan Garlic Chicken is definitely a restaurant quality experience. The fact that this is naturally low carb and keto is a huge bonus! 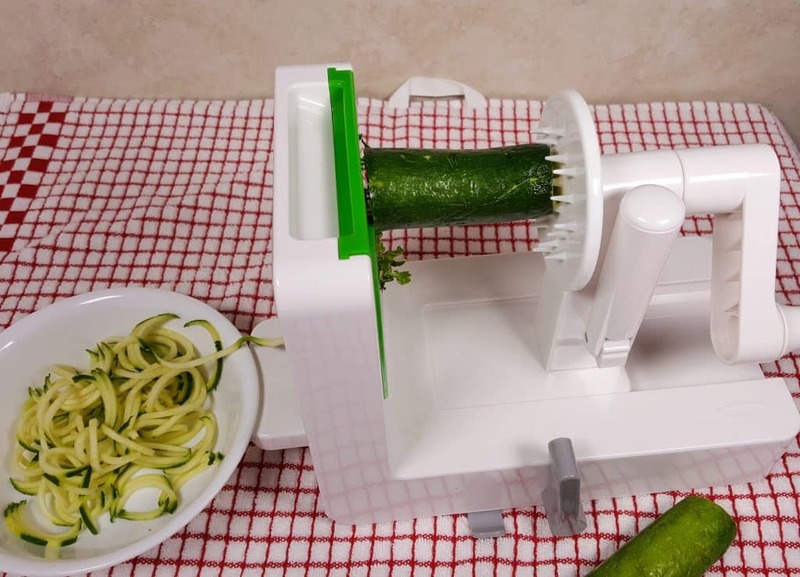 If you are Low Carbing it, use a Tabletop Spirazlizer to make Zoodles! What makes this Instant Pot Tuscan Chicken Recipe Low Carb? Heavy cream is used, which gives it a nice and healthy fat content. White meat chicken is a very nice protein. Butter, rather than flour, helps to thicken the sauce. Strict Keto eaters, may want to omit the Sun Dried Tomatoes. Sun Dried Tomatoes are quite strong, so if you add more, do so at your own risk. 😉 Sun Dried Tomatoes come packed in oil or in just the dried state. If the oil based tomatoes are your preference, there is no problem using them instead. The amount of beneficial nutrients from the sodium, potassium and homemade bone broth, help with keeping electrolytes in check. Another favorite recipe amongst low carbers is Instant Pot Spicy Crack Chicken. This recipe takes the original recipe up a notch. Try it and let me know what you think. The spice is very mild and can be omitted, if desired. As the recipe moves quickly, it is a good idea to have all your ingredients, chopped, diced, mixed and ready to go. 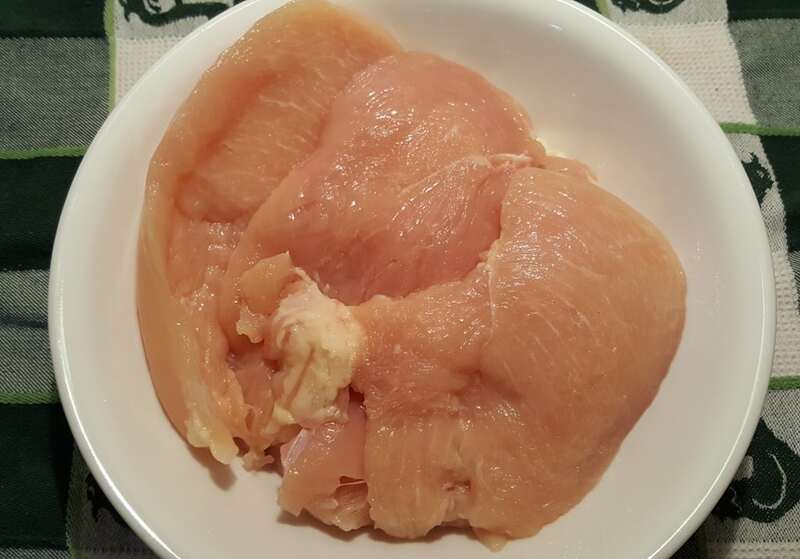 Slice through the thick part of each chicken breast, so that each piece of chicken is about the same thickness. Using a Meat Tenderizer, pound the chicken to make it flat. For a recipe such as this, consider grabbing chicken when it is on sale. Use your FoodSaver Vacuum Sealing System and prepare several bags with the chicken and marinade and pop into the freezer for future meals. 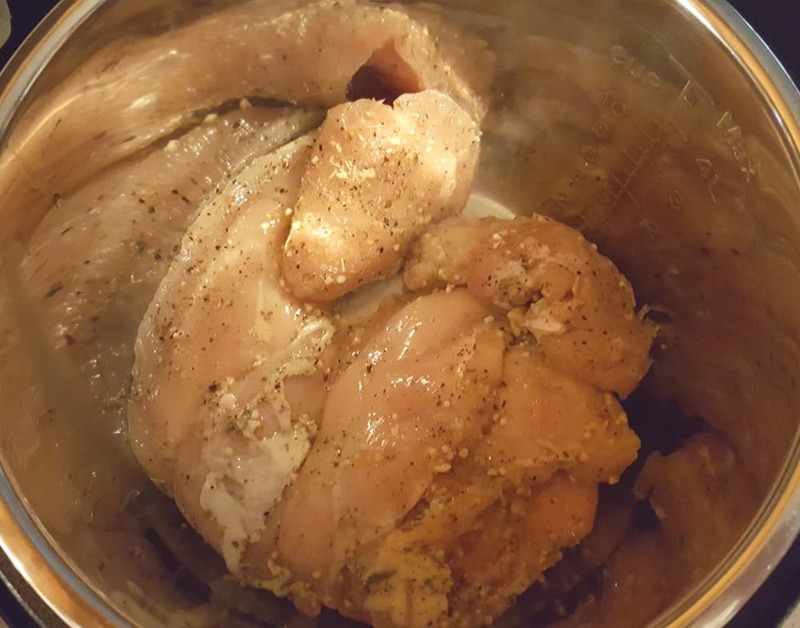 How to Make Instant Pot Creamy Tuscan Garlic Chicken? Marinating the chicken with the Italian seasoning and sea salt in a small mixing bowl will add more flavor to the end result. Spices are rubbed into the chicken and are quickly seared in the hot oil. 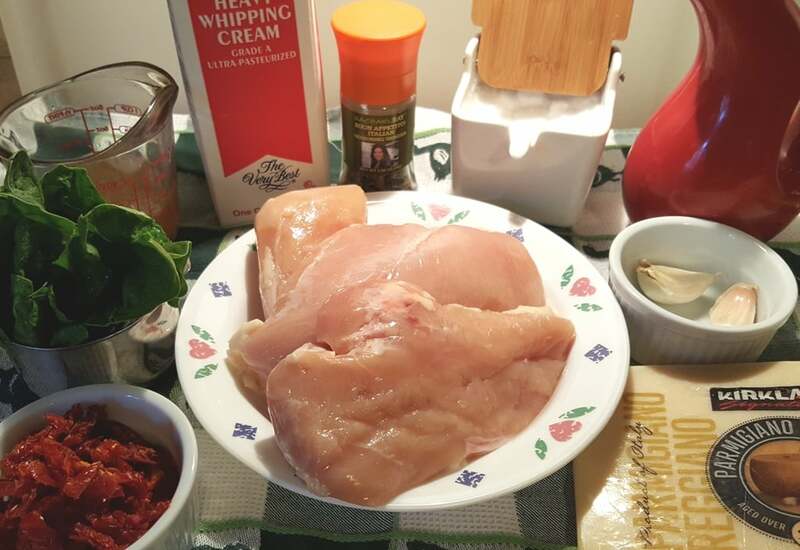 The chicken is then cooked in the Instant Pot, Mealthy MultiPot or Pressure Cooker with the broth and cream. After releasing the pressure, shredded Parmesan cheese and spinach is added. The full recipe and nutritional information is on the Recipe Card below. 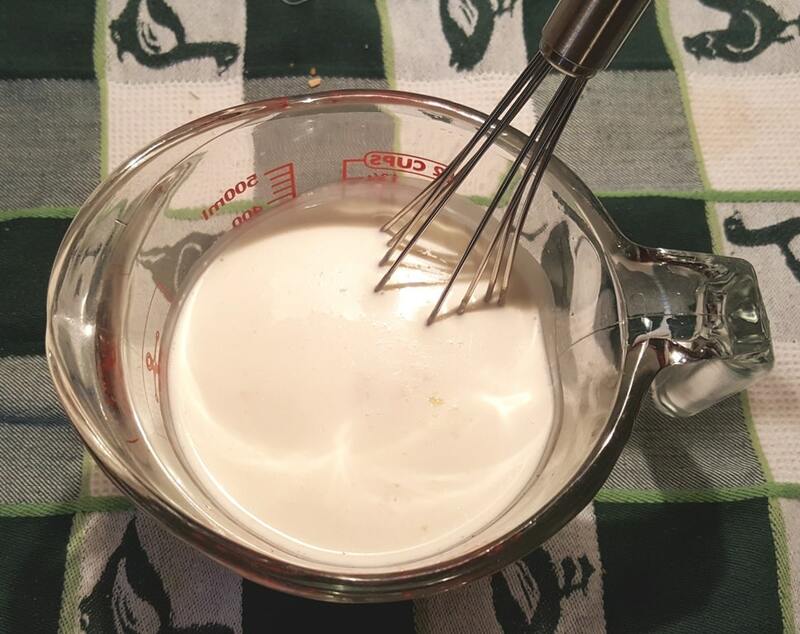 A homemade cream sauce is easy to make. Whisk a little This Old Gal Seasoned Salt into the Cream and set aside. My Homemade Seasoning boosts the flavor to a whole other level! If you don’t have this Rösle Stainless Steel Flat Whisk, think about getting it. It’s my most used Kitchen Tool. Keep a big batch of my This Old Gal Seasoned Salt next to your stove, as it is a great multi-purpose seasoning. 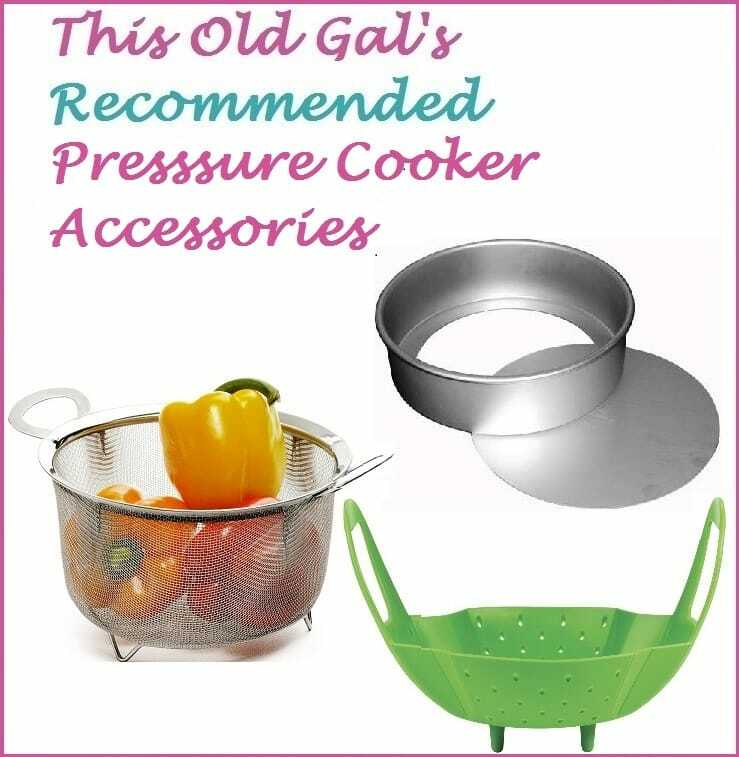 It is great on Pressure Cooker Easy Hard Boiled, Air Fryer Seasoned French Fries, NY Style Coffee Shop Home Fries and more. 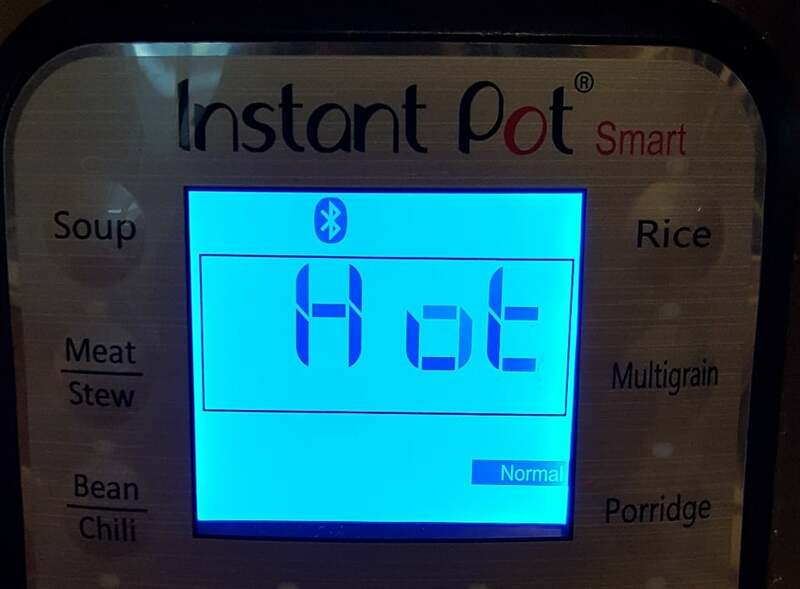 If using an Instant Pot, Mealthy MultiPot or Pressure Cooker. brand of multicooker, select the Sauté or Browning button. For stand alone Pressure Cookers use one of the preset buttons with the highest temperature. Using a good quality olive oil is key to starting with good flavors. Allowing the Instant Pot, Mealthy MultiPot or Pressure Cooker cooking pot to heat fully before adding the fat, helps to make a stainless steel pot, non stick. UNSALTED Chicken Bone Broth/Stock is recommended, so that you can be in control of the salt content. If you do not have Homemade Chicken Broth, grab yourself a jar of Better than Bouillon Chicken Base. It’s very economical and will work very well. 1.5 teaspoons per cup of Fresh Water is a good ratio. 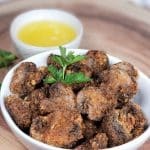 Mushroom lovers love my Instant Pot Creamy Parmesan Garlic Mushrooms Chicken recipe. 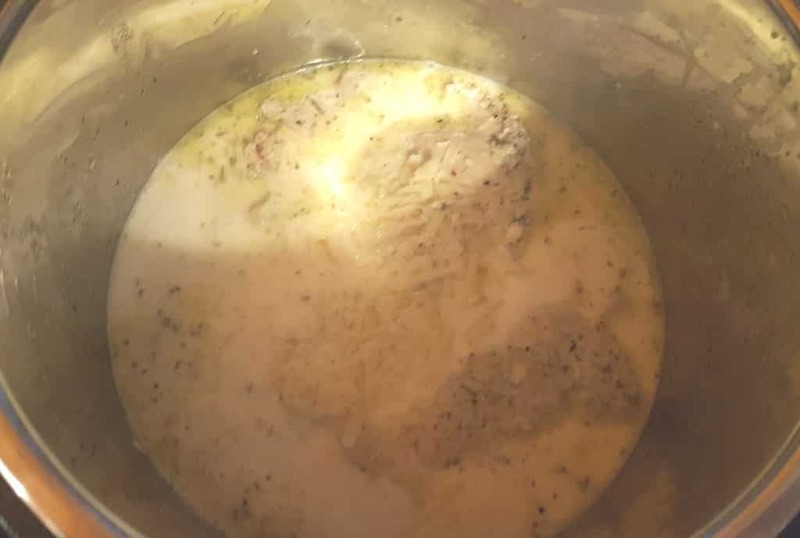 How to Thicken the Sauce for Instant Pot Creamy Tuscan Garlic Chicken? The following is an optional step and not necessary at all. The only purpose is to thicken the sauce. If using the option to first dust the chicken with Potato Starch prior to searing, there is no need to do a slurry and the sauce will thicken naturally, as well as to keep the chicken juicier. My Potato Starch trick, will not only keep the chicken tender and juicy, it will eliminate the slurry altogether and the raw taste that sometimes is detected. For Low Carb and Keto People, cream cheese will thicken the sauce! The chicken may still be slightly pink inside, but will quickly finish cooking to perfection while simmering. For a thicker sauce, whisk and simmer for about five minutes or until the sauce has reduced. Why Grate Your Own Cheese? 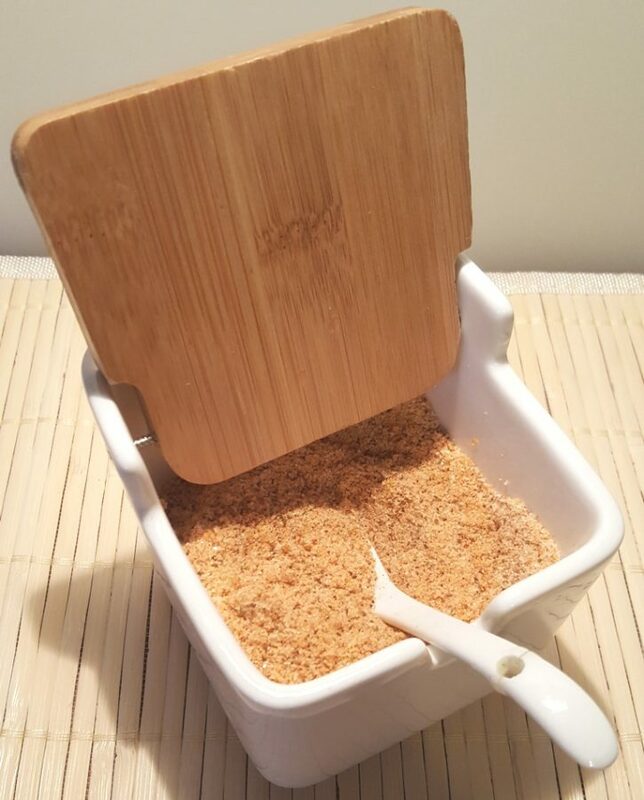 Companies usually put a flour dusting on packaged grated cheese, so that it doesn’t stick. That also causes the cheese to dry out. As the blocks are whole, they have not been subjected to air and bacteria and therefore fresher. Blocks of cheese are cheaper than pre-shredded. 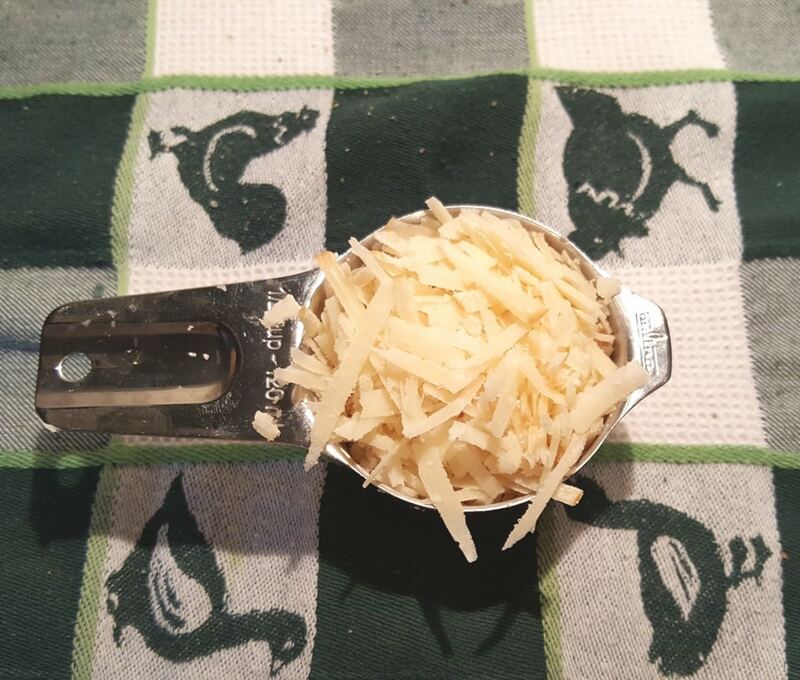 Try buying blocks of cheese and use a Microplane Grater for perfectly shredded cheese. Asiago cheese can be used in place of Parmesan cheese. The flavor is a bit creamier and the texture is usually softer. Experiment with both to see which you prefer. Parmesan and Asiago cheese both work really well for this meal. With my Starch Protection Method, your sauce will be nice and thick. Can Kale be used in Instant Pot Creamy Tuscan Garlic Chicken? Kale works very well in this recipe too. Spinach wilts quickly and kale takes just about a minute longer. Use as much greens as you like. Another idea is to add mushrooms to increase volume and add some vegetable nutrients. This makes a beautiful and colorful presentation! Tips and Tricks for Instant Pot Creamy Tuscan Garlic Chicken. Allow the Chicken to marinate for 10 minutes. Make sure your cooking pot is screaming hot. Only sear for a couple of seconds on each side. Use heavy cream, as anything with less fat, will break during cooking. We did noodles and I think next time, Pressure Cooker Garlic Whipped Potatoes or Pressure Cooker Mashed Cauliflower are in order! For a Mexican themed meal, try this Pressure Cooker Salsa Lime Chicken with Cilantro Lime Rice for an all in one pot meal! Happy cooking. For another creamy and yummy recipe, try my Pressure Cooker Pork Chops in Homemade Mushroom Gravy, which is a one pot meal! Instant Pot, Mealthy MultiPot or Pressure Cooker. 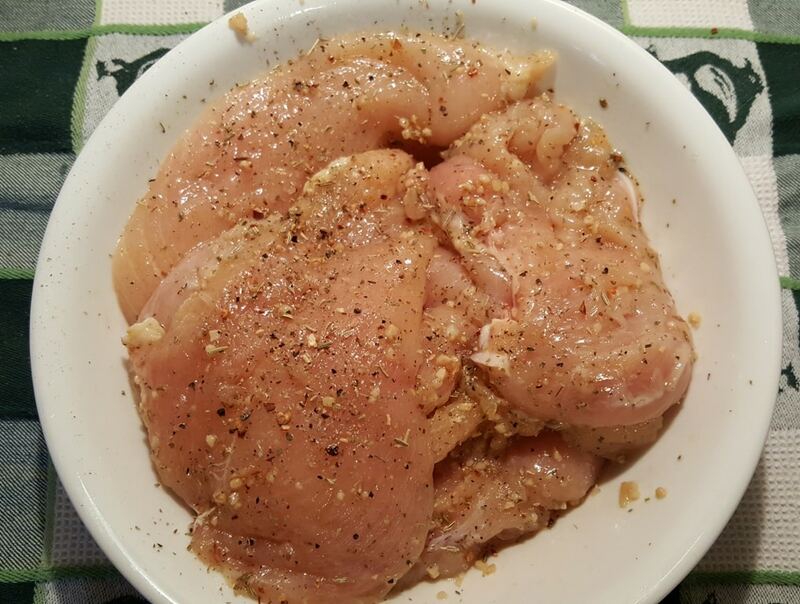 Slice the chicken breasts in half and pound so they are even. When hot, add oil and butter and place the chicken into pressure cooker cooking pot. Brown the pieces of chicken for 10 seconds on each side. Pour in chicken broth, cream and seasoned salt. Quickly deglaze the cooking pot, making sure nothing is stuck on the bottom of the pot. Lock on Lid and close Pressure Valve. Cook at High Pressure for 1 minute. When Beep sounds, wait 2 minutes and then carefully release the rest of the pressure. Select Sauté/Browning on your pressure cooker and bring to slow simmer. Mix in cheese and sun dried tomatoes. Simmer to thicken sauce, if desired. Stir in spinach right before serving. If you like Mushrooms, add 6 ounces of Cremini Mushrooms to the cooking pot after adding in the Chicken Broth. *For a creamier sauce, add 2 Tablespoons of cream cheese when you add the cream. For extra sauce, simple double the seasonings, liquids and Parmesan cheese. To make this a Tuscan Chicken Pasta Dish, double all seasonings, add two cups of chicken broth and 8 ounces of pasta prior to setting pressure cook time. 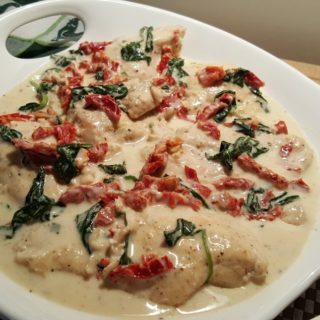 What to Serve with Instant Pot Creamy Tuscan Garlic Chicken? You will have a lot of the sauce, which will be delicious over Spaghetti Squash, potatoes or noodles. I prefer to use DeCecco Farfelle (Butterfly) Pasta as I love the presentation and DeCecco holds up so well!! To keep this recipe, Low Carb and Keto, these Low Carb Miracle Noodles are a great choice. A side of my Pressure Cooker Mashed Turmeric Cauliflower is perfect, as it will sop up all the yummy Sauce. Pressure Cooker Creamy Tuscan Garlic Chicken pairs nicely with my Pressure Cooker Cauliflower Soufflé. Before placing chicken into pot for a quick sear, dredge through coconut flour or potato starch. PIN this Instant Pot Pressure Cooker Creamy Tuscan Garlic Chicken! First of all….these flavors were amazing! My chicken was a little chewy though. I am wondering if it’s due to doing a quick-release as opposed to letting it release naturally? I made this Tuscan chicken tonight, my husband gave it a 10/10. This was the first food I’ve made with my instapot. I’m still getting use to the instapot nd part of the directions on the recipe weren’t clear for the settings but I winged it. I served it over steamed rice, definitely will make this again. I haven’t made much in my IP, but I just tried this tonight and it was delicious! I even went all out and made your house seasoning. I used a little more than 1/2 cup cheese and had to adjust my seasoning just a tad lower because my broth was “low sodium”, but otherwise I made it exactly as written. I do not have a pressure cooker. Could this be made in a crockpot instead? This looks amazing and I saw two different people post a picture of this meal they just made and they included a link to your post!! This was great, fast, easy, flavorful. The only thing I would do differently next time is remove the chicken for the 5 min cream saute at the end. It would make the chicken more tender. Also, I added more cheese, because I like cheese! My sauce curdled. What did I do wrong? Hello, do you have the nutritional value of this dish? Do you have the nutrition info for this meal?? Can you use almond milk in place of heavy whipping cream to make this dairy free? I was wondering this too! Thought it might be too “thin” (watery)? Maybe we could swap for canned coconut cream got the heavy whipping cream?? Am I missing something? I thought I needed to add 1 cup of liquid to pressure cooker. I want to try this tonight but I don’t know if this 1/4 cup of broth is all I add. I also thought the same thing and I did add maybe 1/2 cup instead if 1/4 because my chicken was very thick. This was so yummy! Definately could of used more spinach and will try the cream cheese next time. Thank you so much! I can’t remember if I made this or the Tuscan soup before but remember liking it. Planning on having for dinner tonight. I don’t own a meat mallet. Have put your recommendation on my Amazon list though. My breasts are already thin so I’m assuming it will be ok not to pound them won’t it? FYI also put cute salt crock on wish list too! Made last night and it was delicious! I used one pound of boneless thighs, cut into large chunks, and served it over zoodles. Made this for dinner tonight & it was delicious. However, the Instant Pot directions were not clear after the Sautée setting. I’m new to IP and got very frustrated going from sautee to Pressure cooking and settting the time. What buttons do you use to transition from Sautee to High Pressure for 3 minutes? Thank you for the delicious recipe. I will follow you regularly if you can help me! This was lovely, but I sauted a chopped onion, 4 chopped Cremini mushrooms, substituted 1/2 c stock and 1c half & half with 1 Tbspb. Of flour whisked in for additional sauce. Use the OFF button to cancel and change settings. One word: DELICIOUS. Thank you for the recipe! All I can say after finding this recipe is that I trust you! This is a great dish. Can Yogurt whey be used in place of the chicken broth? Or can I add Better than Bouillon to the whey?? My hubby cleaned his plate…twice. that says volumes.. I did add the cream cheese just to thicken it. 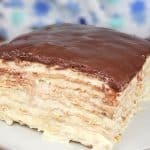 This is a totally wonderful and tasty recipe! When I showed this to my husband before I made it, he thought we should double it so we would have leftovers. I used a little extra meat but didn’t double it so I could make sure about the recipe after trying it once. Well….. needless to say, it was a HIT!! Everyone absolutely loved, Loved, LOVED IT! Will definitely double everything next time! Thanks for an amazing recipe!! Love, love your Tuscan chicken recipe! Thank you. We gave our kids and grandkids IP’s for Xmas. They also love your recipe! 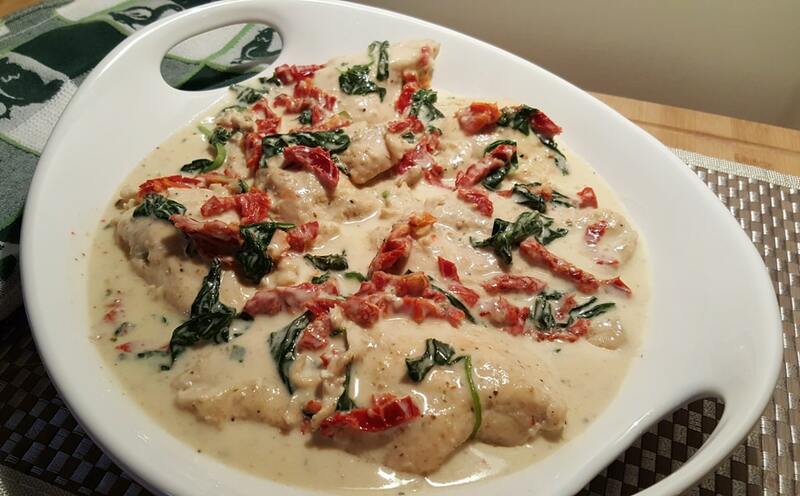 pressure cooker creamy tuscan garlic chicken. Do you use the sundried tomatoes in oil or not. This came out DELICIOUS! I’m not much for measuring, but i knew i wanted extra sauce so there was probably extra broth (yes, homemade) and cheese. I also added a few glugs of white wine because my sauce was sticking to the bottom (extra cheese?? Lol). The mushrooms were a great addition, as was the cream cheese. I threw everything in the pot, then lined my upside down tall trivet with tin foil so i could also cook some cut up red potatoes at the same time. I used the same seasonings and a couple of dabs of butter, and slits in the foil for the yummy juices to mix with the chicken and sauce. 8 minutes on high (my chicken was still slightly frozen) and a controlled QR and everything was perfect. I might only do 6 or 7 minutes next time. I do not have an electric hot pot and have a regular pressure cooker what fluid ingredients and time do I use? How long should I expect the pressure to build on high or other settings before reducing heat and releasing pressure.Thank you. This was delicious! My husband said it was a keeper and to put it on the ‘make again’ list. I love the fact that by making your on season salt you omit salt and I cut the sea salt to a 1/2 teaspoon and used Kosher Salt instead plus I used low sodium chicken broth. 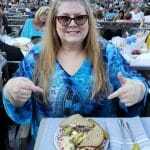 My husband is a heart attack survivor and your recipes are so good and easy to modify as far as salt consumption. 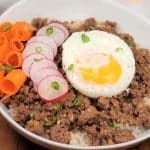 My favorite instant pot recipe! I impress everyone I serve it to! I have adjusted it to vegan, Dairy-free, and gluten free, depending who I serve it to. But the best result is by the recipe, but making extra sauce with more cheese, more veggies, including mushrooms, more cream and adding a good amount of cream cheese! I made this one night then had leftovers another night as there just my DH & me. It was so good that DH didn’t want dessert afterwards. That’s good! Looking forward to making your pork Chops with Mushroom Gravy. Cook time is only for 1 min? I made this for family that was visiting and everyone really liked it. I had 2 options to serve it over: pasta and butternut squash spiraled “noidles”. The butternut squash noodles added even more flavor! So good! Sounds great! 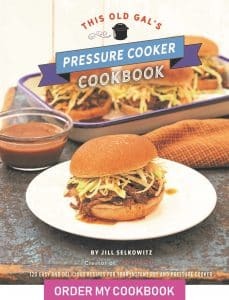 Is it really only one minute pressure cook time? This sounds great and I have all the ingredients. BUT the instructions say to pressure cook for 1 minute. Then in the notes it says if I want to make it a pasta dish to “reduce cook time to two minutes.” What am I missing? How do I reduce two minutes if it’s only cooking for one minute? Thanks! I am going to cook this during the week but have a couple of questions I don’t see answers for in the comments. Does it cook for 3 minutes total or 2 minutes total once it as reached pressure? Someone below said they cooked it for like 6 minutes?! Also, you say if you add the pasta to reduce the cooking time to 2 minutes. So just confirming, once I’ve added all the liquids, I add the extra broth and pasta and then only cook it for 2 minutes when it reaches pressure? Including the chicken? I thought adding stuff might require more time. Thanks! Easy recipe and great taste. I suggest 5 minutes instead of 1 if adding pasta. This was delicious! I made it exactly as written and used spaghetti for the pasta. Turned out great. Next time I’ll add mushrooms. I am wondering it it would be possible to use frozen chicken? Obviously the marinade wouldn’t work as well, but what would the cook time be for frozen chicken? Is it possible? Would be awesome if this could be made from frozen. Hi! 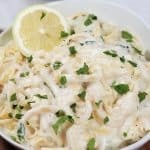 I made your Greek Lemon Butter Fettuccine last night and it was a huge hit! Can’t wait to have the leftovers tonight. Question on this recipe…if I’m adding pasta do I increase the cook time?